In just a few short weeks the summer will be over and everyone will be heading back to school. Boston is a college town with thousands of students living in apartments for the first time. I often see many students doing their first grocery shop of the year. I would like to offer a few suggestions about grocery shopping to this very group of people. I have already talked a little bit about stocking both a spice cupboard and a food cupboard. Today let’s talk about the refrigerator! The most important thing to remember when stocking a refrigerator is to check the “sell by” dates on ALL perishable items. Surprisingly, there is no law in the US saying that items with expired “sell by” dates MUST be removed from supermarket shelves. Granted, stores would be nuts not to be very careful to remove these items. But it is up to you to check the date. The dating jargon can be very confusing. The United Stated Department of Agriculture (USDA) has a fabulous site which answers just about any questions you might have on the subject of dating on food products . Open the carton and check to make sure none of your eggs are broken. It is best to keep eggs stored in their original carton. You get to choose between whole milk, 2%, or 1%. The numbers indicate fat content. I like whole milk for my coffee but 1% on my cereal. Butter should be kept covered or wrapped, as it does absorb odors. For toast, I like the spreadable kind, which often comes in its own tub. A beginning cook can take advantage of the availability of frozen vegetables, many of which are fantastic. Vegetables are often taken at their most ripe and flavorful and fast frozen to preserve taste and color. It is really handy to keep some of your favorites in the freezer. Just remember that frozen vegetable do not last forever. Any foods left too long in the freezer can develop “freezer burn” and become inedible. There are quite a few frozen fruits, like peaches, mango, blueberries and strawberries, available at the grocery store. Fast-frozen fruits work really well in smoothies. Toss some frozen blueberries, and strawberries in a blender with some yogurt or milk and you’ve got yourself a great snack or breakfast! Keep a loaf of bread/bagels/English muffins in the freezer. Be sure to use it within about 4-6 weeks. You can put a slice of frozen bread directly into the toaster. It will only take a few extra seconds to toast when it’s frozen. 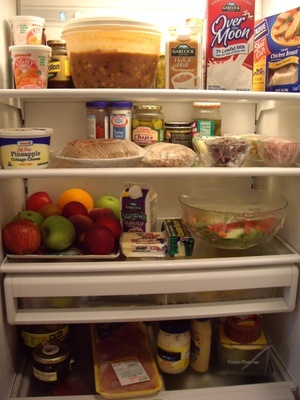 Many foods from the cupboard, once opened, need to be put in the refrigerator. This applies to mayonnaise, mustard, ketchup, relish, and pickles. These sorts of condiments will last several months in the refrigerator. The inside of your refrigerator does not have the same temperature everywhere . There is usually a separate bin for fruits and vegetables. These bins are generally not as cold as the main part of the refrigerator. Neither is the storage space on the door. It is really convenient, though, to store things that are used often on the door. Do remember foods in both the refrigerator and the freezer are (ultimately) perishable and need to be properly wrapped to make them last. My old friend Roger was a great cook, but his refrigerator looked like a chemistry experiment gone wrong. When storing leftovers, they should get wrapped in plastic wrap or tin foil. Most leftovers should be eaten within two to three days or tossed. No point in taking chances! i have a question about my fridge. not sure if this is the right place to ask though. i have adjustable humidity settings on my drawers and i was wondering if fruits and vegetables or cheeses should be kept on a higher humidity or lower humidity. also, i have to keep a block of cheese in my fridge at all times. i’m not much of a milk drinker (use it in recipes) but just a tiny piece of cheese is enough calcium for one serving! i also keep tartar sauce and cocktail sauce for seafood, steak sauce, salad dressing, and lemon juice. Hi Jessi, great question! Humidity controlled drawers are designed specifically for fruits and vegetables. These drawers will extend the life of your produce. They are also a bit warmer then the rest of your refrigerator as fruits and veggies donâ€™t need to be kept as cold as meats, etc. Vegetables need more humidity than fruits. (Have you ever noticed vegetables, and not fruits, at the grocery store often have a sprinkler system above them?) I usually leave the humidity settings at mid range, but you might want to play with the settings on your specific refrigerator to see whatâ€™s best for you. The American Cheese Society has a very brief, but good description on how to wrap and store cheese. Cheers! Should you store yoghurt on the shelves or in the door of your fridge? Apples soften faster outside the fridge than inside. By how much? Twice as fast? Five times as fast? If you eat vegetables and cheese together, it is very good for your teeth. But what kind of cheese? Are brown eggs better for you than white eggs? How long will carrots last in a fridge? How long can you keep a cooked turkey in a fridge? We need 50 nutrients for good health. How many of these can be found in milk? Do eggs contain vitamin A? WoW! You sure do have a lot of questions! The USDA is an excellent source for everything you have ever wanted to know about food and nutrition! How long can you store cooked foods like soup or chowder in your refrigerator before you have to use it up? Hi Richard, The golden rule is…when in doubt…throw it out! Do you know the rule on how long you can keep a dip like that in the fridge for? if at all? If you have dinner leftovers, once cooled, they can be covered and put in the refrigerator. Cold or reheated leftovers make for a great lunch! Leftover party food is a totally different story. One of the ideas I was going to add is something I can see you do in your fridge, not sure if it is on purpose or not. Raw chicken, seafood, eggs, or meats all should be stored on the lowest shelves of the refrigerator. This way if something for some reason leaks, the contamination can be easily contained. It also makes for easier cleaning. We always keep our milk in the fridge, near the front for convenience, but not in the door, because as you mention it is not as cold. Thanks KCatGU – you are so right! In fact I often get a bag from the produce section to wrap the (raw) chicken in before bringing it home.